Yup'ik Sisters set out from the Catholic Mission at Hooper Bay on a gathering expedition. 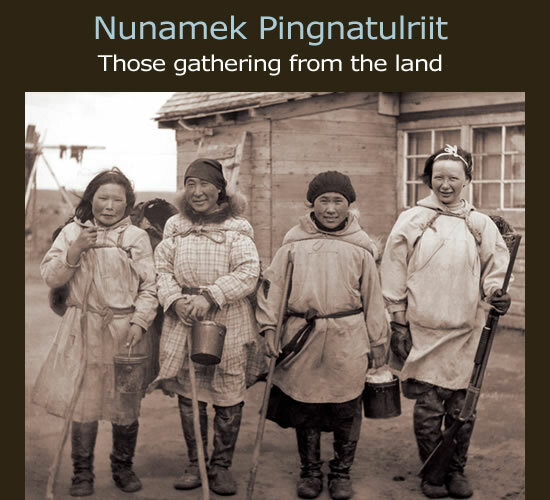 Nunaput man'a nunakluku canek naugitulria. Tamakut aturluki naumalriit. We live on this land of ours that grows things. We use the things that grow. To this day, as soon as snow is gone, women and children begin walking over the tundra in search of edible greens and tubers--sourdock, mare's tail, wild rhubarb. By the end of July and early August, families spend days gathering berries by the gallon. In fall, grass is ready to harvest. Those who know where to find them even uncover the caches of tundra mice, collecting the roots and tubers neatly stored inside.